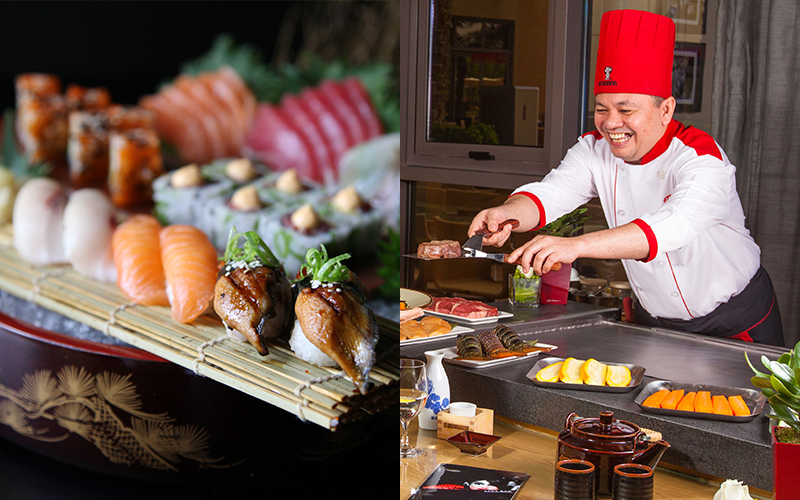 For a dining experience without fuss and frills, Benihana is a go-to spot for me. Why? Because it’s consistently good, offers value for money, a fun and relaxing atmosphere and casual, familiarity. Choose from indoor seating in the restaurant or around one of three teppanyaki tables, or alternatively enjoy the lovely winter weather from the restaurant’s idyllic terrace that overlooks the Arabian sea and is lit by candles and fairy lights at night, creating a rather romantic atmosphere. Seated and ready to explore the new menu, we’re advised that each meal should begin with a ‘zanzai’ – a selection of hot and cold starters. So, we opted for a portion of steamed duck gyoza with soya and spring onion, which were generously stuffed and tasted wonderful, and for cold, we had the beef tataki with spicy garlic dressing. Next, we indulged with a signature sushi and sashimi platter, filled with a selection of fresh salmon and Hamachi sashimi, plus varied sushi options including our favourite of the night, the crispy prawn tempura roll. On chef’s recommendation, for mains we shared the wok fried crispy chili beef striploin, and from the grill, the seabass glazed with ginger ponzu – which was expertly cooked and simply delicious. For those with a sweet tooth, menu options range from warm chocolate fondant and citrus rice pudding, to Hokkaido pannacotta and the famed Japanese ice cream, mochi. The team at Benihana are incredibly friendly and welcoming. Right from arrival, they make you feel at home and ensure you’re looked after at all times. A place to visit for great food in a relaxed and casual atmosphere with family or friends. If you’re thinking of stopping by anytime soon, don’t miss the newly introduced ‘Rush Hour’ special daily from 5pm to 7pm featuring sharing plates of sushi, sashimi, tempura and other nibbles for Dhs25 and beverages from AED 20. Details: Priced at around AED 250 per person for three-courses, without beverages. Call 04-4282000. For more information, visit Benihana.